Woah! 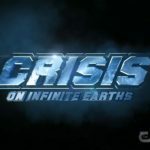 John Wesley Shipp is back in the Arrowverse crossover as the 90s Flash in these new images! Plus new pictures of the black Superman suit! Tyler Hoechlin returns as Superman for The CW’s Arrowverse crossover this year! Yes! It’s official! The Flash and Supergirl TV Shows are crossing over this March! With Prometheus having just hit on DVD/Blu-ray, Andrew looks back at the history of the Aliens on the silver screen and also their greatest nemesis… the predators.